A perspective I have regarding Conrad Murrell was expressed well by Andrew Bonar about his close friend, Robert Murray M'Cheyne, in 1838 and is what I feel about Conrad: "What amazes me about his life, more than anything else, is his desire to show God's grace to others, and to feed upon it himself." 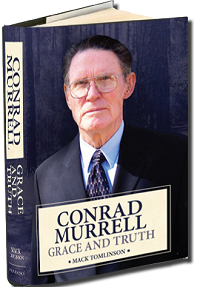 Many of Conrad Murrell's sermons can be heard at these two web sites. I cannot reflect on the life and ministry of Conrad Murrell without a sense of profound gratitude to God. Since the day I first met him nearly forty-five years ago, his impact on my own life and ministry has been inestimable. His unusual spiritual authority, his insight into the "heart" of Scripture, his ability to analyze men and movements, his great wisdom in dealing with thorny pastoral problems, and his example and skill in personal counseling have all affected me deeply. Conrad Murrell was a "pastor's pastor." The impact of his life and teachings will continue for generations to come through the men he mentored and encouraged. May this biography challenge and inspire us to follow in his steps! In C. H. Spurgeon's book, Eccentric Preachers, he tells the story of eleven unique men that God raised up to preach the gospel of Christ. Among them were such men as John Berridge, Rowland Hill, and Billy Bray. Each servant was, as Spurgeon said, "A man of original mind who strikes out a course for himself and follows it with success." Conrad Murrell is such a preacher. I was privileged to hear him preach on many occasions in several states and found him to be unswerving in preaching the Word of God. He didn't speak smooth things designed to make him popular. He never sought notoriety for himself, but was a faithful proclaimer of truth. May God give us more "eccentric preachers" like Conrad Murrell, men who fear God, not man; men who are frank, not funny and men who are bold, not timid. I will never forget the first time I met him, and his steely eyes and inviting smile. Though my exposure to Conrad Murrell came later in his ministry, I was immediately drawn to the man. But more importantly, getting to know Conrad caused me to know Jesus Christ in a deeper way. I spent an extended time with Conrad several years ago, and he became a spiritual father to me that I never had. I refer to him as the "old prophet." His knowledge of the holy extends beyond theological accuracy to the knowledge of the Holy One Himself. This is how you feel when you are with Conrad, an awareness of the presence of God. This book will give you insight as to why knowing Conrad Murrell is to know our Lord better. I am thankful this book has been written to bring us a glimpse of that experience. I have known very few men who are as spiritually minded as Conrad Murrell. He is one of those choice servants of God who walks with the Lord daily, not trying to impress anyone. He has a real heart for people and a real love for them. Anyone who took the time to be with Conrad found him to be a rare jewel. I thank God for the opportunity to truly call Conrad my friend, as he has been a great personal spiritual influence in my own life. He has a way of preaching to pastors who are not clear on different aspects of God's Word to help them to see glorious truths they have never seen, and as a result, they are never the same again. The life and ministries of many men were transformed through the teaching and preaching of Murrell's ministry. He could give profound answers with quiet authority that people recognized as being from God, which spoke to everyone. It is my conviction that Conrad Murrell is one of the finest thinkers and preachers of the twentieth and twenty-first centuries. The Lord will give the final analysis on that, but that is my opinion of Conrad Murrell. If you have a question, ask the author!